Last week Josh asked if I knew how to make chicken and biscuits, and I had no idea what he was talking about. I Googled it, and came up with this ...which is Joshua approved by the way. 1. In a large pot, boil the chicken until cooked through. 2. Lay the chicken breasts in a casserole dish; set aside. 3. In a medium-sized mixing bowl, combine the undiluted cream of chicken and cream of celery soups with one soup can of water. 4. Pour half of the soup mixture over the chicken; set remainder aside. 6. Bake at 350° until bubbly. Remove from the oven. 7. Open biscuit can and place individual biscuits on top to cover mixture. Return to oven and bake until biscuits are done. Enjoy! As always, I made a few modifications. I didn't have any canned mixed veggies, so I thawed about four cups of frozen, and it worked fine. I was debating on whether to boil the chicken or not. I ended up doing it, and it wasn't as awful as I thought it would be. I'm typically always a chicken roaster, but boiling does work. I actually hate chicken breast, and only cook it for Josh. So no matter which way I cook it, unless its covered in fried breading, I'm not going to like it. They are not kidding on how long this takes to bake, that is why I bolded the times at the top. It took forever. I have a slow oven, but it took closer to three hours for this to cook all the way through. I never mess with chicken though, it has to be done done or we're not eating it. Josh really liked this, and actually asked for it two days later. I told him it was too soon for me. It really just tastes like a chicken pot pie. 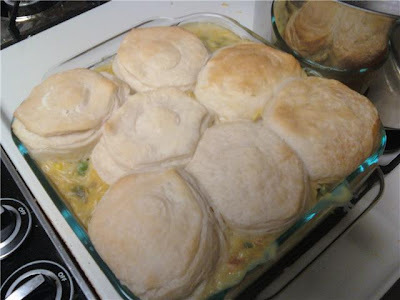 I was a little messy with the biscuit placement, but I was so tired of cooking that I really didn't care. :) This recipe was not hard at all, just time consuming. Perhaps I would be a little better if I weren't making it while studying for a final...but who knows.